Home » Immune System » Is acute bronchitis contagious? Acute bronchitis is a temporary form of bronchitis caused by a virus – which means it cannot be treated with antibiotics. If you’re wondering if acute bronchitis is contagious, the answer is yes. 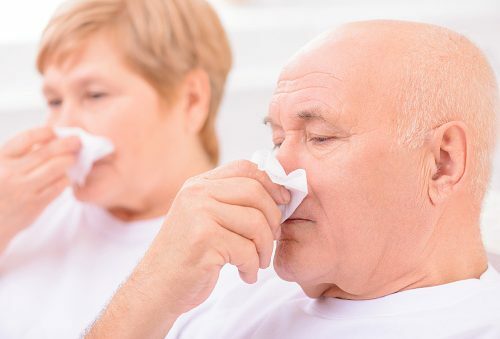 Similar to influenza, acute bronchitis is transmitted person-to-person by droplets that are released into the air through coughs, sneezes, or talking. The virus may also spread if you touch an object that a sick person has touched and then touch your mouth. Symptoms of acute bronchitis include sore throat, fever, cough with phlegm, chest congestion, shortness of breath, wheezing, chills, and body aches. Diagnosis of acute bronchitis first begins with a review of a patient’s medical history and examination of symptoms. If there’s insufficient information for the diagnosis, your doctor may perform a chest X-ray, sputum culture, throat cultures, and influenza tests. Not only will these tests help narrow down on a diagnosis of acute bronchitis, they can also help rule out other similar conditions such as influenza or pneumonia. As mentioned, acute bronchitis is caused by a virus, so antibiotics are not advised as a treatment for two reasons: they are ineffective against the virus and they can contribute to developing antibiotic resistance. Rather, common treatment for acute bronchitis involves taking over-the-counter medications, using humidifiers at home, drinking plenty of fluids, drinking a ginger tea, and consuming honey for soothing your throat. If you are having difficulty breathing with acute bronchitis, your doctor may prescribe an inhaler to help open up the airways. Just like with the flu, you should be getting plenty of rest, letting your body to heal itself. Avoid any strenuous activity and stay away from others in order to reduce the transmission of bronchitis. To lower your risk of acute bronchitis, steer clear of those who are ill, frequently wash your hands or use alcohol-based sanitizers, avoid touching your mouth or eyes, and get the annual flu shot to protect yourself against the influenza viruses.